It was a great trip for Ed to the Rocky Mountain Elk Foundations Elk Camp at the Las Vegas Convention Center. He spent a few days with the boys of Maven from Lander, Wyoming and worked on a new elk piece titled “Billowing Up”. It is 3x5ft acrylic and ink on canvas. It was a great place to work Americana with Cowboy Christmas right downstairs and the National Finals Rodeo in town. After a great season of elk hunting at the No Business Lodge in Valley County, Idaho, Ed’s work has been recently been inspired. His new paintings reflect his time in the woods. Being in Vagas with all the other hunters was a great time to reflect. Also, Ed brought “Bugle Once”, the recent selection of the RMEF catalogug from their Featured Artist Program. 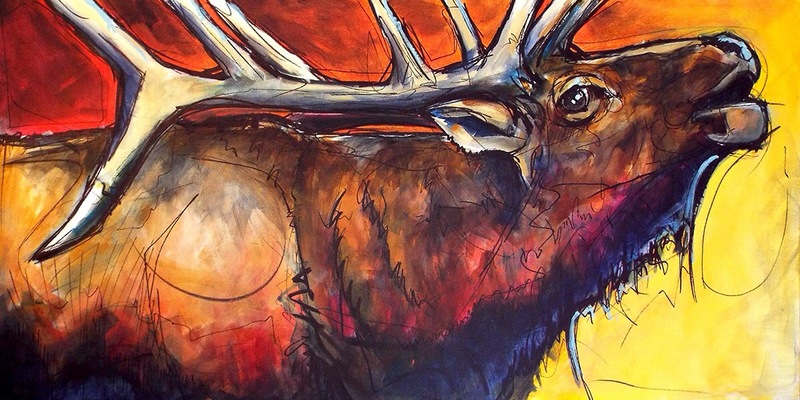 The Rocky Mountain Elk Foundation has chosen Ed’s “Round Valley Bull” as part of their supplemental art program. Prints will be available through the Foundation’s annual catalogue and will function as a method of fundraising for local chapters. Stay tuned to his Facebook page and Instagram feeds for updates on when this print will be available to purchase. The original is presently available through the studio, please contact us directly if you are interested. This exciting new partnership marries two of Ed’s passions, wildlife and art. He’s thrilled that this project will support the fundraising efforts of local Rocky Mountain Elk chapters and will further sustain the health and habitat of this great species. The Rocky Mountain Elk Foundation is dedicated to preserving the future of elk and other wildlife, as well as their habitat and the hunting heritage. For more information about the Rocky Mountain Elk Foundation, please visit their website. The Art of Fishing is opening in Boise and Ed is very pleased to be showing with some of the fly fishing industry’s best young artists at the Fulton Street Showroom in Boise this spring. The exhibit will include Paul Puckett, AD Maddox, Andrea Larko, Josh DeSmit, Josh Udesen, Travis Sylvester, Jake Keeler, and others. This group has been featured in Gray’s Sporting Journal, the Fly Fishing Journal, the Drake, Fly Fusion and most other industry leading publications. Additionally, this group has added their art to fishing products by Patagonia, Simms, Montana Fly Company, Yeti, Fincognito and many others. The show will run through early summer and will have some events.